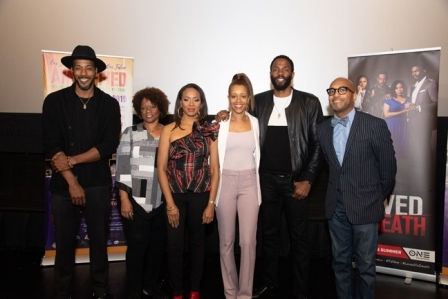 Recently, TV One showcased the screening of their upcoming crime-drama “Loved to Death” starring actors Malinda Williams, MC Lyte, Tobias Truvillion, and McKinley Freeman at the 27th Annual Pan African Film & Arts Festival held at the Cinemark BHC Theater. Directed by Lee Davis, the film trails the story of Malinda Williams’ character that believes she’s found true love with the right man but ignores warnings from her family about her former lover. Haunted by her past while in the pursuit of true love, Williams’ character Deborah Ross endures potentially fatal tests that leave her fearing for her life. Actor Tobias Truvillion serves as Williams’ love interest Chuck Everette in the film and meets his paramour at church. The couple almost instantly falls in love, develop a relationship, become engaged and prepare for marriage until the plot takes an unruly turn. “My character comes into Malinda’s character’s life while she’s going through some turbulence in her love relationship. Before they get married, some unfortunate circumstances happen,” Truvillion stated. And because this happens all too often, where both men and women do not get the proper healing they need after dealing with trauma in their relationships, Truvillion says it’s time mental health and domestic violence be taken seriously. “I think it’s important for us to understand that mental health issues, domestic violence, these things happen all the time and that there is a support system, you don’t have to go through these things alone,” he said. “Us as men, as Black men, we have to do a lot of healing. Once we can heal within ourselves and heal with each other and be brothers, then we can come together and support our sisters properly the way we’re supposed to,” Truvillion continued. Grammy-nominated rapper, actor and TV-personality MC Lyte, says knowing the signs of an abuser has a lot to do with self-love and self-awareness. “First of all you’ve got to be aware, you’ve got to be aware and you’ve got to have a certain amount of self-love to even understand how it is that you should be treated. First you have to treat yourself well to understand how others have to treat you,” she declared. “As far as my role in this film, I’m the young lady’s sister and I’ve got my doubts. Oftentimes, even when you have someone that you’re close to and you can see where the relationship is headed, you can voice your opinion but sometimes they have to go through it for themselves,” MC Lyte continued. Throughout the film, viewers can expect to see raw realities of a woman trying to escape her abuser after ignoring signs from those who care about her the most. Visually, Director Lee Davis says his goal was to “to shoot an intimate film” and “create portraits of people that would be memorable” to capture a story that is unfortunately all too real for many people. “Inspired by actual events, this true crime story is really pertinent because there are so many women who are facing domestic violence in this country. We wanted to get the message out that you have to assert yourself; somebody needs to intervene, whether it’s a family member or a friend,” Davis said. “My role in this movie is to make people uncomfortable because more often than not the conversation that needs to happen is avoided. For me personally, I’ve had friends who’ve lost their lives to domestic violence. It’s an uncomfortable topic but it’s a topic; everything is uncomfortable until you talk about it so hopefully the performance in this movie helps accelerates that conversation,” he continued. We also caught up with Noelle Bellinghausen who portrays the officer that arrests Burris in the film. Bellinghausen says that it’s important to speak up when someone we know is enduring abuse of any kind. “I think sometimes in our community we tend to not want to get in people’s business, we don’t want to rub people the wrong way or stir the pot but I do think you save lives when you talk about it,” she stated. Overall, director Lee Davis says that while there is no “quick solution”, he hopes the film will cause victims and abusers to get help. “Getting out sounds easy when you’re not on the inside, so this journey helped me understand how difficult it can be for someone to extricate themselves from the situation. Realistically, I hope that we inspire people to make that move,” he continued. Viewers can expect to see “Loved to Death” premiering this summer on TV One. To see exclusive interviews with the cast, visit www.lasentinel.net.